In a small town, reputation is everything. 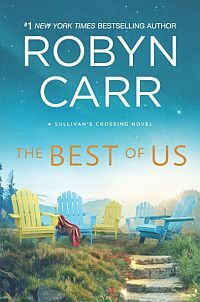 In her latest novel, #1 New York Times bestselling author Robyn Carr explores the burden placed on a young man returning home to face his mistakes—the first step in claiming the life he was meant to live. Winning over his father isn’t the only challenge. 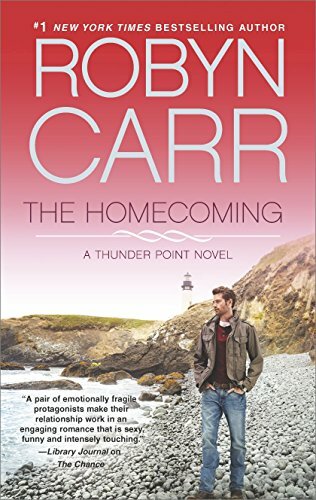 Seth must also find a way to convince his childhood neighbor and best friend, Iris McKinley, to forgive him for breaking her heart. With his homecoming, will Seth be able to convince the town, his family and especially Iris that he’s finally ready to be the man who will make them all proud? Chapter OneWhen Seth Sileski was a kid, Thunder Point had been his playground. From the time he’d been a freckle-faced, toe-headed little kid he’d held this town in the palm of his hand. He could run the fastest, hit the hardest, throw the farthest and charm the most cantankerous teachers. His two older brothers, Nick and Norm Junior, affectionately known as Boomer, had also had great childhoods in this little town, but almost nothing compared to Seth’s notoriety. He went from beautiful kid to adored adolescent to most popular and accomplished teenager — great grades, superb athlete, handsome and a good and loyal friend. And then, at the age of twenty, his life took a dramatic turn and all that great luck and good fortune seemed to blow away. Or, if you listened to his father, Norm Sileski, he threw it away. So now he was back in Thunder Point, a little scarred and damaged but whole. And definitely humbled. He’d traveled a long way since leaving at the age of eighteen and if you’d told him five or ten years ago that he’d come home he’d have called you a lunatic. Yet here he was, and by choice. This time he was wearing a deputy’s uniform. Thirty-four years old, his battle to regain a sense of pride and accomplishment had been mighty and difficult. Seth was taking over the Sheriff’s Department Thunder Point substation from Mac McCain. He’d be the officer in charge while Mac moved to a lieutenant’s position at the headquarters in Coquille. Seth had been back to town fairly often over the last fifteen years. He visited his mother and at least tried to check in with his father. Every time he drove into this small coastal town he was surprised by how little the place had changed. People changed, the economy changed, the world changed and yet Thunder Point seemed to remain the same. The linoleum in the diner had been old and cracked when he was a boy, all the same fast food establishments were present, Wayland’s Bar was still the only real dive in town and it looked no better. In fact, Wayland still held the door open with a paint can, as if he intended to paint the place. It hadn’t happened yet. It was the second week in September and school had resumed just a couple of weeks ago, so there was still a lot of optimism and excitement winding up the kids. Those on bikes weren’t staying out of the middle of the road very well, but little whoop-whoop from the police SUV moved ‘em over quick, followed by yelps of laughter and shenanigans. He caught sight of Iris, his next door neighbor and childhood friend when he was growing up. She was still riding her bike to school, but now she wore a skirt with a briefcase in the basket. When the wind took her skirt it revealed tight, black bike shorts underneath. The kids raced her. The school buses passed her, tooted their horns and kids leaned out their windows to wave. She jingled the bell mounted on her handlebars and waved in response. She threw back her head and laughed as a bus driver laid on her horn for a long blast. She still had that wild, unrestrained laughter he remembered. Before she noticed him, he slowed down and turned off the main street, heading back to the substation to park. The Sheriff’s Department substation was fairly new. The department had always had a strong presence here as there was no local law enforcement, but the substation office was only about ten years old. The clinic next door was new so he made that one of his first stops. He walked into the clinic to face a beautiful woman standing in the reception area. She could be mistaken for Catherine Zeta Jones with her dark straight hair and black eyes. The doctor came to the front of the clinic wearing the native dress — blue jeans and denim shirt. “So, you’re the new guy,” he said with a smile. “Did you know Mac before now?” Peyton asked. “Do you have teenagers, Deputy?” Peyton asked. Seth made his way to the diner to say hello to Gina. They’d known each other growing up, but they hadn’t been in the same class or part of the same crowd. It was safe to say that he knew Carrie better; Carrie and his mother, Gwen, had been friends for years. He even went into Waylan’s. Damn if it didn’t look like the same crowd of old boys who had been in there the last time he stopped by at least ten years ago. He headed for the flower shop which still bore the same name although the owner was relatively new. Pretty Petals had been owned by his next door neighbor when he was growing up, a single mother and Gwen’s good friend, Rose McKinley. Rose’s only child, Iris, had been Seth’s best friend when they were kids. Iris sold the shop a few years ago after her mother had a stroke. Then Rose passed away after a couple of years of infirmity. Seth talked to his mother at least once a week, usually more often, and she kept him current on the happenings in town. Rose’s death had taken a toll on Gwen — they’d been close to the same age. Rose had died too young and it left Gwen feeling like she was living on borrowed time. Gwen was now sixty-five. Norm, his dad, was seventy-two and just as cranky and unforgiving as ever. He might’ve sold the service station he’d owned for decades, but he wouldn’t retire. He still worked for the new owner. Gwen wanted to spend some of their money and retirement doing fun things, traveling, maybe taking a cruise or two, but Norm wasn’t at all interested. Why Gwen wanted to spend leisure time with the old coot was beyond Seth, but he felt sorry for her, sitting out her last years in the same small town, not having too much fun except for church, cards and bingo, missing her best friend, Rose. He dropped in to Pretty Petals and took off his hat. He said hello to Grace, the owner. His mother had mentioned her several times. She was an attractive young woman about thirty years old or even younger, living the dream. She bought the flower shop from Iris and was thrilled to own her own business. Looking around he saw that it was updated since the old days. “Well, Seth, are you back to stay?” she asked. “I’ll do my best. Be sure to let me know if I can help in any way. It won’t be flower arranging, I know that.” He gave her that same business card with all the numbers on it. Then he gave her a second one. “One for the shop, one for home.” He secretly hoped that second card might make its way into Iris’s hands. It was Iris he’d really like to reconnect with. When they were kids, they’d been inseparable, playing kickball, softball, fishing, playing on the beach or sitting at one of their houses playing video games for hours. In junior high and high school they had other paths — he was on boy’s teams and she was doing girl things, plus helping her mother in the flower shop from an early age, but she’d always been his closest friend even if he didn’t admit that in mixed company. But he could tell Iris anything. Anything. If he had trouble in school, frustrations in football, couldn’t get his homework right or even if he liked some girl and she wasn’t liking him back. They talked on their porches, on the phone, anywhere they met around town. If their second story bedroom windows had faced each other’s, they’d have been hanging out of them, talking. Then there was some misunderstanding their senior year. Something to do with prom, but he didn’t remember all the details. He obviously didn’t remember them the way she did because that was the end of their friendship. She was angry that he wasn’t taking her to the prom, but he was going steady with someone else and was expected to take his girlfriend. But he and the steady girlfriend had had a blow-up, a messy breakup, Seth had been bummed, had a few beers, and as usual leaned on Iris to talk about his girl problems. It was senior year, he’d had a spectacular year, was going to the University of Oregon on a full football scholarship in the fall and how dare that girl dump him right before senior prom. He could only vaguely remember, but he had uttered some lame thing to Iris like, I wish I was taking you, anyway. And then he got back together with the girlfriend the very next day. He thought Iris would be happy for him. He had expected Iris to understand — it had been a spat and they were all made up. But Iris did not understand. There was something mysterious about girls and proms because he couldn’t remember Iris ever being so angry with him. She’d even beat him up a few times when they were little kids and she hadn’t been so mad. He apologized about a hundred times, but she was through. She wasn’t going to help him with his homework, listen to him moan and groan about his love life, cheer him on through all his big-headed accomplishments and then just sit home with her mother on prom night. Over. Done. Find yourself another sap to be your pal. “We are friends,” she had replied. So now he was back. This town was going to be a big job. Mac had told him to be prepared to be on duty all the time whether he was on duty or not. There might be four deputies on the clock in town as well as the whole Sheriff’s Department not all that far away, but as the supervisor he could be called upon whenever a supervisor was needed. Seth understood; he knew that when he signed on. Along with a commitment like that, he had two other impossibly big projects ahead. He had to somehow make amends with his father. And he had to get Iris back. He was going to find a way to show them both — he might have been that shiftless, inconsiderate kind of teenager, but he was not that kind of man. “Are they basically in good shape with grades?” Gina asked. “Iris, what made you decide to be a high school counselor?” Gina asked. “Me?” Iris asked. “Oh God no! He was the most popular kid in school! The homecoming king and star player. He dated the pretty girls.” And she took another bite. “That’s where the limp and the scar happened?” Gina asked. And Iris nodded. She looked down at her plate and picked at a couple of potato chips. “It’s not that much of a limp,” she finally said. “He never told me exactly what happened.” But Gwen Sileski had. Gwen told Rose and also Iris everything about Seth. He’d fractured bones in his right leg and required rods and plates and screws just to hold him together. He’d had a lot of other injuries and was lucky to be alive. He’d had several surgeries to save the leg. The injury and the repair left his right leg a little shorter and he wore a lift in his shoe. His mother said he wasn’t in pain, but it had taken a lot of therapy and then training to get to that point. Iris couldn’t imagine how hard the police physical exam must have been. Gina smiled. “It would take a lot more than that to make Seth Sileski hard to look at.” She drew an invisible line across her cheek with her index finger. “Nah. Not at the moment. There have been a few I thought had potential, but in the end I preferred my own company.” She stood and fished into her pocket while Gina transferred the rest of her BLT and fries into a carton. “And the company of high school students,” Gina teased. The diner door opened and Seth Sileski walked in, as if made to order. Beautiful Seth. High cheekbones, chiseled chin, moody eyes, white teeth, thin scar slanted across his cheek. Iris’s mouth fell open and Gina just laughed. “Why do you always seem to be rushing off the second I show up?” Seth asked. “I’m sure it’s just a coincidence. Next time, Seth. I’d better go.” She flashed him an accommodating smile and headed out the door. She took off at a gentle jog down the street and up the hill toward home. Why? she asked herself. Why the hell does he have to be here? Is this just some vindictive angel’s idea of a slow and miserable death for me? What did I ever do to deserve this? He could be here for a long time! How am I going to avoid him for years? Especially if he’s the person I have to work with if I have teenagers in trouble? Really, hadn’t she been through enough in high school?